I’ve mentioned before that I was a little skeptical of The Accountant from the title, but after seeing the trailer I wanted to find a few movies like it! Sometimes crime can be right where you least expect it. I love how sometimes these crime movies can make crime pop up and be so much bigger and roe complicated then it seems at first. Like crime becomes a game, and criminals are the pieces! If you are looking for some crime and thriller movies like The Accountant, then this list is totally your style! The Accountant is a 2016 action thriller film that will be in theaters on October 14, 2016. 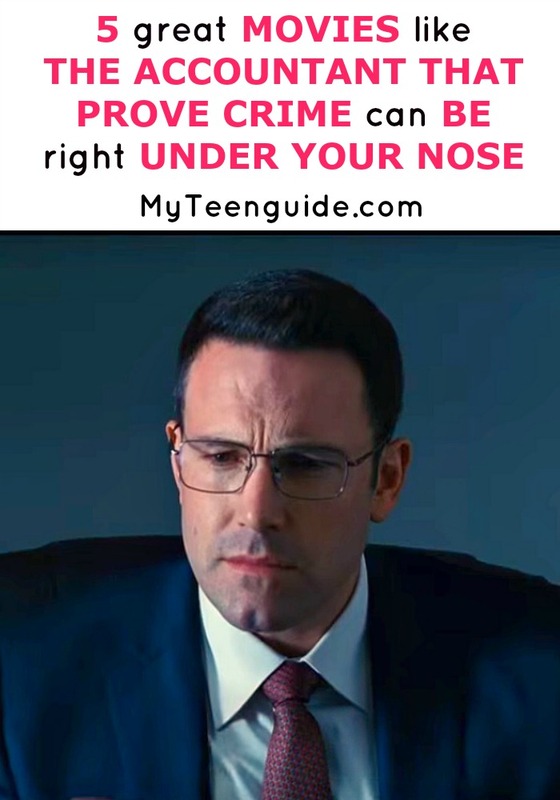 The film stars Ben Affleck as Christian Wolff, a mathematics savant who works for some evil criminal clients. Here are some other movies like The Accountant. State of Play is a 2009 political drama and thriller movie that is adapted from the 2003 British television series of the same name. It is about the murder of the mistress of Congressman Stephen Collins. An old friend and journalist, Cal McAffrey, begins his own investigation into the murder…and the congressman. State of Play stars Russell Crowe as Cal McAffrey and Ben Affleck as Congressman Stephen Collins. Triple 9 is a 2016 crime thriller drama movie that showcases the plan to murder a police officer by a gang of criminals and a group of corrupt police officers. The murder is a diversion for them to pull off an elaborate bank heist in town. Triple 9 stars Chiwetel Ejiofor as Michael Atwood, Norman Reedus as Russell Welch, Aaron Paul as Gabe Welch, Anthony Mackie as Marcus Belmont, Casey Affleck as Chris Allen and Woody Harrelson as Detective Jeffrey Allen. Sicario is a 2015 crime thriller drama movie that focuses on an FBI Agent who is sent by a government task force to help on the United States/Mexico border with the escalating war on drugs. Sicario stars Josh Brolin as Matt Graver, Emily Blunt as Kate Macer and Benicio del Torro as Alejandro Gillick. Edge of Darkness is a 2010 political thriller movie that is based on the 1995 British television series of the same name. The movie showcases the life of Thomas Craven, a homicide detective who looks into the death of his daughter and discovers she had a secret life he never knew about. He also uncovers massive political corruption in the process. Edge of Darkness stars Mel Gibson as Thomas Craven. Spy Game is a 2001 spy movie that stars Robert Redford as Nathan Muir and Brad Pitt as Tom Bishop. The movie is about Nathan Muir, a retired CIA Agent who looks back on his training of Tom Bishop, while working to get him free from his captors, against agency politics. So what do you think about these movies like The Accountant? I was a bit skeptical of The Accountant itself from the title, but watching the trailer it looks pretty darn good! Tell me your favorties from this list, or other intense crime movies you love down in the comments!